RSI (Relative Strength Index) is one of the popular overbought and oversold indicators used in the forex market. Previously, traders tended to use the RSI indicator only. However, this time we will use a combination of RSI and Moving Average (MA). So, not only use the RSI, but we will also use the MA filter to find out the direction of the trend more clearly. Okay, let's start by adding an MA with a time period of 100 to the chart, to filter the direction of movement of prices, and RSI with the standard period 14 in your graphic settings. 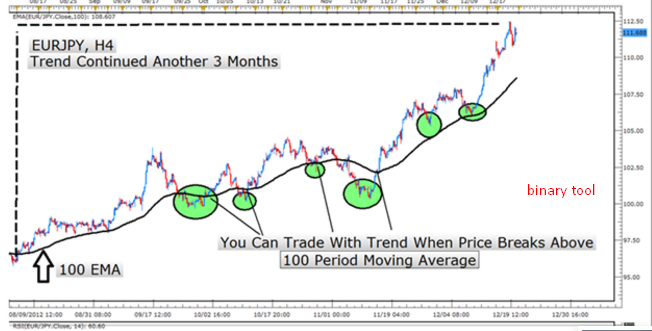 With the 100 period MA, we will only see trade with a trend (trading trend). 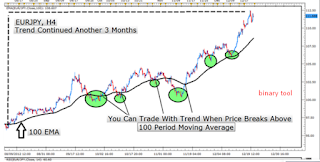 Beyond that, such as counter trade trends that actually also allow results to occur, only those results can be said to be lacking, and in the end, not worth the effort or capital spent. On the chart, the Relative Strength Index value will always range between zero and 100. This value is based on relative strength on trend momentum. This RSI is an indicator that compares the average movement in a certain time period. The example below is a chart that describes trends based on RSI and MA. How do you read it? First, try to look at the MA line that moves up. That means the trend is running bullish. Then, when the RSI is in area 20, you can open a position right in that area, and be allowed to make a purchase transaction. 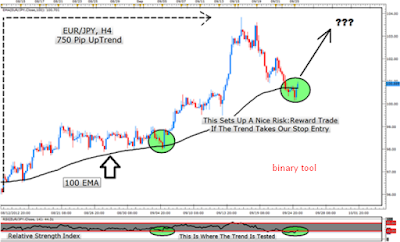 The EUR / JPY currency pair is below, on the 4-hour chart, where the RSI consistently bounces up in line with the prediction of the MA trend. When an up-trend occurs, we will see a consistent value, which is always above 40-50. This indicates the overbought level.